Join a global movement to promote epilepsy awareness for International Epilepsy Day on February 11! More than 120 countries participate, working to highlight the problems faced by those with epilepsy, their families, and caregivers. 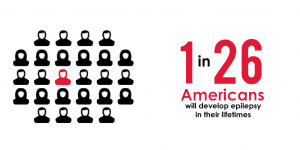 Read on to learn how you can support epilepsy research while spreading the word about how prolific epilepsy is. Also in this update, learn about the Seizing Life podcast episodes which recently launched and get the details about the upcoming Day of Science event in Houston. Listen to the Seizing Life Podcast Now! Seizing Life is available now! Watch or listen to full episodes on podcast platforms, including Apple Podcasts and Google Podcasts, or on seizinglife.org. 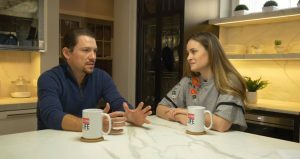 Married with Children…with Epilepsy: Hear advice on keeping a marriage strong while raising a child with epilepsy from HAMILTON Chicago star Miguel Cervantes. Inspiring Kindness and Sparking Friendships Through Empathy: Learn how The Nora Project encourages compassionate curiosity in the classroom, sparking friendships between students and their peers with disabilities. A Mind Unraveled, a Memoir by Kurt Eichenwald: Journalist and New York Times bestselling author Kurt Eichenwald discusses living with intractable epilepsy, the discrimination he faced, and what inspired him to share his story. Plus this month, look forward to an interview with CURE founder Susan Axelrod. Never miss an episode! Subscribe to receive updates every time an episode airs. Join the CURE community in raising funds for research and spreading epilepsy awareness on International Epilepsy Day. Set Up a Facebook Fundraiser: Ask your Facebook friends help you fund research to find a cure for epilepsy. Share why raising funds for epilepsy research is so critical and encourage people to donate! Click here for a detailed guide or set up your fundraiser now. Spread Awareness on Social Media: Show your friends, family, and followers how widespread epilepsy is, as well as how vital better treatment options are to so many people around the world. Download and share stunning epilepsy statistics to your social media pages. Visit Select Chicago Häagen-Dazs Shops: Attend Ice Cream for a CURE at Häagen-Dazs shops in Harlem Irving Plaza or Lincolnwood Town Center. When you donate to CURE, you’ll receive 10% off one item. Also, a portion of the day’s sales from each location will benefit CURE. Houston: CURE Day of Science is Coming Your Way! At the CURE Day of Science event in Houston, leading experts answer your questions about epilepsy. This free event on Saturday, March 30 gives those impacted by epilepsy and their families the chance to learn from researchers and physicians in an encouraging environment. 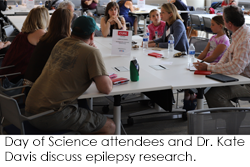 During Day of Science, a panel of epilepsy experts address audience questions and participate in small-group discussions over lunch with the attendees. What targeted treatments have been developed due to the discovery of new epilepsy genes? What factors must be considered when moving my child from pediatric to adult care? What are the risks associated with epilepsy surgery? What epilepsy drugs are currently in development and what types of epilepsy can they be prescribed to treat? This event is made possible thanks to the generous support of the BAND Foundation and Sunovion. Stay tuned: more Day of Science locations around the US will be announced soon!